We start with the 2018 Hockey World Cup. Hosts India lost to the Netherlands in an even contest that saw the Dutch team come from behind to win the quarterfinal in the last few minutes. India, who have not qualified for the semifinals of the world cup since 1975, looked set to break that jinx this year, thanks to a well-knit team that seemed to be in good form. But the Netherlands have been in great form as well. World number four Netherlands taking on fifth-ranked India in the quarterfinals promised to be an absorbing match, and it delivered. India got off to a great start, with Akashdeep Singh scoring a goal in the 12th minute. That elation didn’t last long. Thierry Brinkman equalized for the Netherlands just three minutes later. Then followed a period where the Dutch tried to grab a lead but were thwarted by some great defence by India, and in particular by midfielder Kothajit Singh who put on a fantastic performance. India too made more than one attempt at taking a lead but the Dutch defence was up to the task and denied the hosts an advantage. In the fourth quarter, with 10 minutes left in the game, Mink van der Weerden converted a penalty corner to make it 2-1 for the Netherlands. With this loss, India’s 43-year wait to rewrite Hockey history just got longer. The Netherlands will meet Australia in the semi-finals on Saturday while England will take on Belgium. Badminton news now. PV Sindhu finally broke her own jinx, pulling off a shock win against top-ranked Tai Tzu-Ying of Taiwan at the BWF World Tour Finals in China on Thursday. 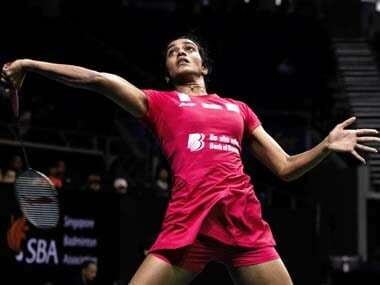 Sindhu defeated Tzu-Ying 14-21, 21-16, 21-18 in 61 minutes of the most thrilling badminton. The come-from-behind win was special as it came against an opponent whom Sindhu has not won against in their last six meetings over two years. Sindhu defeated Akane Yamaguchi in her opening match, making this her second impressive win at the tournament. She will face Zhang Beiwen in her last group match later today. In the men’s draw, Sameer Verma dominated his match against Indonesia's Tommy Sugiarto and won in straight games to stay in contention for the knockout stage. Sameer, who is ranked 14 in the world, faced no problems against 10th ranked Sugiarto, defeating him 21-16 21-7 in 40-minutes. He had lost to world number 1 Kento Momota in his opening match, which made a win against Sugiarto crucial. In football, Greek club Olympiakos defeated AC Milan 3-1 on Thursday, which meant the seven-time European champions Milan crashed out of the Europa League. Elsewhere, Eintracht Frankfurt fans ran riot during the German side's win at Lazio. For nearly an hour, Olympiakos and AC Milan fought hard but failed to make any breakthroughs. Finally, in the 60th minute, Pape Abou Cisse, the Greek club’s Senegalese defender, scored the first goal. Nine minutes later, Cristian Zapata scored a comical own goal to make it 2-0 for the Greek hosts. A chastened Zapata made amends two minutes later, scoring Milan’s first goal but Olympiakos hit back with another goal in the 81st minute. The Greek club finished on 10 points, level with Milan. But they qualified ahead of the Italians because of their superior goal difference. They are now two points behind group winners Real Betis. Meanwhile, Celtic FC lost to Red Bull Salzburg 2-1 but still made the cut. An ISL update now. Bengaluru FC continue to extend their unbeaten run in the current season. Following two consecutive draws, defeated ATK 1-0 at home. Bengaluru’s Australian midfielder Erik Paartalu’s header was the only goal in a closely fought game that ended with Bengaluru’s first win in three matches. With this win, they extend their lead at the top of the table to six points as the season heads into the international break. ATK are in sixth place with 11 points from 12 matches. They are still searching for a win after going winless in six matches. The 10th leg of the sixth season of the Pro Kabaddi League ended last evening with the match between the Telugu Titans and Patna Pirates. The Titans defeated the Pirates by a mere five points, 41-36, in Visakhapatnam yesterday. Rahul Chaudhari became the second man to reach the 800-raid point mark in Pro Kabaddi as he led the Titans' charge with 13 points. Nilesh Salunke supported Chaudhari, scoring nine raid points. Pardeep Narwal top-scored for the Patna Pirates with 12 points. The Titans had a good start - Nilesh Salunke made a super raid and took out four Patna players in just the second minute. Two minutes later, they inflicted an all-out to make it 11-5. At halftime, the score was 26-15 in the Telugu Titans’ favor. They stayed in front the rest of the game to win 41-36. Both Patna Pirates and Telugu Titans remain in contention for a place in the playoffs that begin 30 December after the end of the 12th leg on 27 December. India defeated Pakistan to enter the final of the ACC Emerging Teams Asia Cup being co-hosted by Pakistan and Sri Lanka. Eight teams are participating in this year’s edition of the cricket tournament - India, Sri Lanka, Pakistan, Bangladesh, Afghanistan, Hong Kong, Oman and UAE. All of India’s matches have been held in Colombo. Set a target of 173 by Pakistan, Nitish Rana and Himmat Singh, both from Delhi, made unbeaten half-centuries, as they added 126 runs for the fourth wicket. After a top-order collapse that caused a few jitters, Rana scored a run-a-ball 60 and Himmat made 59 off 58 deliveries, reaching the target in just 27.3 overs. Rana hit three sixes while Himmat smashed five maximums. Earlier, India bowled out Pakistan for a paltry 172 in 44.4 overs. Leg-spinner Mayank Markande was the most successful bowler for India, taking four wickets and conceding just 38 runs in 9.4 overs. India will face Sri Lanka in the final on Saturday.